What Connection do Apples Have to the Holidays? Did you know that apples play an important role in many different cultural traditions around the winter holiday? Here are a few fun facts about apples during the holidays. Christmas (in the traditional sense) may not be widely celebrated in China but many young people have developed a tradition that happens on Christmas Eve – giving a gift-wrapped apple. Some say this is because the Mandarin word for Christmas Eve (or peaceful eve) sounds a lot like the word for apple. In China, stores sell apples wrapped in festive paper or colourful cellophane; all ready for gift giving. It makes for quite a pretty present. If you decide to wrap one up, make sure it’s an Ambrosia apple so that you’ll be guaranteed a big smile when it’s unwrapped. Apples hold an important role in Jewish holiday celebrations at this time of year. Rosh Hashanah is the Jewish new year when celebrants will dip an apple slice in honey to signify a sweet and fruitful year to come. Around Hannakuh, you’re much more likely to enjoy an Ambrosia apple in the form of apple sauce next to traditional potato latkes. The tradition of decorating a tree around Christmas time goes back to pagan times. At that time, a tree was decorated with paper, candles, fruit and nuts. The most common fruit used was the apple. As paganism gave way to Christianity, this tradition was adopted as a part of Christmas. Some say that’s why ornaments are round; they mimic the gold-wrapped apples Germans used to place on their Christmas trees. Believe it or not, Christmas stockings didn’t used to be totally stuffed. They just held one simple gift – an apple or an orange. Over time, a lot more items made their way into stockings but even today, the toe is often filled up by a perfectly shaped piece of fruit. Parents love to see kids pulling out an Ambrosia apple from their stocking because it’s such a naturally sweet treat! Apples aren’t just for stockings. They’re given as gifts in many Eastern European cultures. For example, young men have traditionally given girls a decorated apple as a romantic gesture at Christmas time. 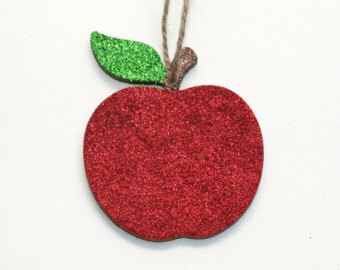 Ambrosia apples make a great addition to your holiday decorations . It can add a nice bit of shiny red to your greenery, fill up a bowl (strategically placed within easier reach than the candy canes), or serve as the base of a traditional pomander. A pomander is made by placing cloves into the flesh of an Ambrosia apple. It can be a part of your holiday centerpiece, on a mantle or hung from a sturdy bough of your tree. You’ll love the spiced apple aroma it gives off. With apples being one of the few local fruits that are still fresh at this time of year, it’s no wonder that they’ve found their way into so many winter holiday traditions. That’s good news for everyone because we all want more reasons to enjoy Ambrosia apples!